From the end of the Depression to the early years of World War Two, cinema building and remodelling boomed in urban centres and regional towns across Queensland, drawing heavily on the Art Deco style. This was cinema’s “golden age” – a time when people flocked to the pictures to enjoy a nightlife beyond the 6 o’clock closing of the pubs and to escape into fantasy worlds of adventure and romance as temporary relief from financial hardship and war. Queensland’s most luxurious Art Deco cinema was the Metro Theatre in Albert Street, Brisbane, built in 1937 on the site of the former Flemings Buildings. 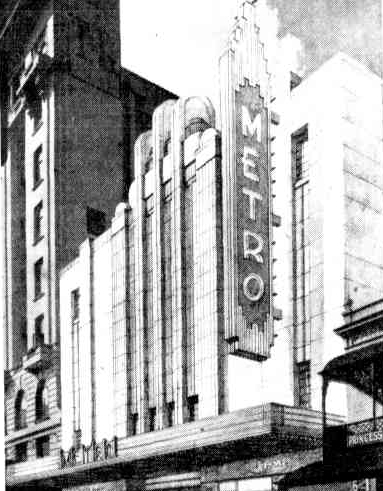 The Metro was billed as the first new theatre constructed in Australia from the ground up since the Depression. It was the fifth cinema acquired nationally by the Hollywood studio, Metro Goldwyn Mayer (MGM), following in the footsteps of the already-established St James and Liberty Theatres in Sydney, the Metro in Melbourne and Brisbane’s Cremorne Theatre. In the 1930s, MGM was one of eight Hollywood studios with offices in Brisbane. As one element of the Metro development, the company built administration headquarters on Elizabeth Street to house its Queensland film exchange. It was not unusual for American film companies to also branch into cinema construction – it formed part of a calculated strategy to monopolise every aspect of the local film industry, from production and distribution to exhibition. This caused some to lament the so-called “Americanisation” of Australian culture and the weakening of traditional British ties. MGM strictly controlled the aesthetic of its cinemas, importing designs directly from America. One of the company’s construction advisors, William W. Fountain, was brought from New York in 1936 to oversee the project, having led MGM’s global expansion in cities such as Calcutta and Johannesburg. Fountain collaborated with Brisbane architects, Hall and Phillips, who were local leaders in the modern style having already designed Art Deco landmarks such as the Empire Theatre in Toowoomba, the Southport Town Hall on the Gold Coast and Shell House in Brisbane. However, on a stormy afternoon in February 1937, tragedy struck Fountain. Flying over the McPherson Range on his way to a MGM convention in Sydney, he was one of four people killed in the infamous Stinson plane crash – a story made renowned by the O’Reillys of Lamington National Park whose ancestors led a dramatic rescue of survivors 10 days later. Fountain left behind his wife and two children who had relocated from New York to Ascot, and was buried in a grave at the site of the plane wreck. Another American, A.E. Boettcher, was brought in by MGM to complete the work Fountain had started. The Metro facade exemplified the angular “jazz” style of Art Deco, its vertical fins creating a skyscraper effect as a symbol of the modern metropolis that Brisbane was clambering to become. At night, a 42-foot neon sign and blue and amber light beams illuminated the cream exterior, which was also adorned with modern materials such as polished red granite and chromium metal. Let moods be what they may … all moods melt into a common consciousness of harmony within these walls. Anxiety and care slip from the mind like a garment that is laid aside, when once the smiling atmosphere of the Metro Theatre enfolds the guest. The theatre seated 804 people in the dress circle and 607 in the stalls, and was designed in a saucer shape so that every seat commanded a direct view of the screen. In keeping with modernity’s interest in the intersection between art and science, the Metro’s decorative features doubled as acoustic aids for screening the new sound films, commonly known as “the talkies”. The interior of the theatre was designed as a “shell” for optimal sound transmission, with wall decorations absorbing soundwaves and preventing reverberation. Popular additions to the cinema included air conditioning, ice water fountains, cushioned velour chairs complete with hat racks, and headphones for the hearing impaired. Special retiring rooms fitted with dressing tables and a full-length mirror enabled women to perform their cosmetic rituals, inspired by the Art Deco divas they watched on screen. A sunbathing and recreation roof, as well as an underground tunnel allowing easy access between the front entrance and the stage, were provided for staff. 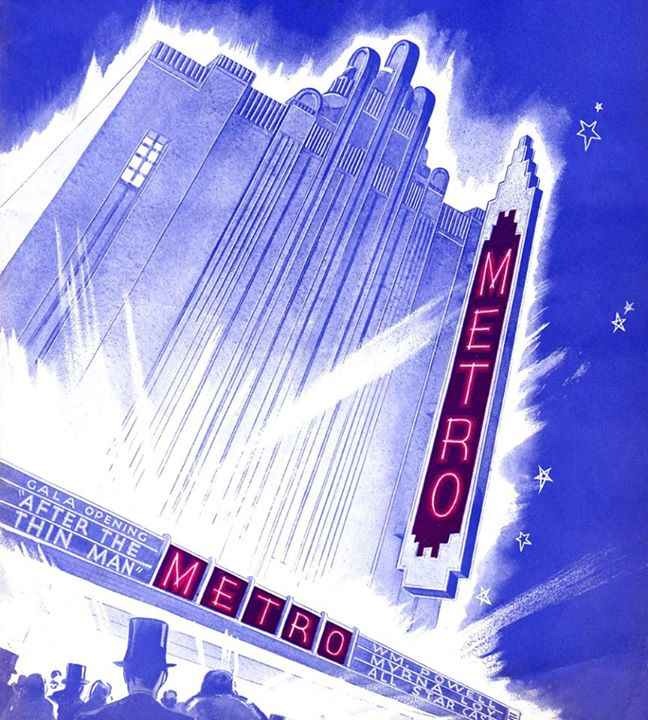 The opening of the Metro on 10 November 1937 was a gala event, commensurate with MGM’s sizable investment in the project of £130,000. The evening was broadcast on local radio stations 4BK and 4AK, helping to generate a buzz among Brisbane residents. MGM held a competition to decide the Metro’s opening feature, with 2000 locals casting their vote. Of 10 films on offer, audiences chose After the Thin Man (1936), starring William Powell, James Stewart and Myrna Loy, whose on-screen wardrobe reflected the latest in Art Deco fashions. From the outset the Metro became a favourite haunt of Brisbane cinema goers, leading some to make permanent seasonal reservations. On opening night, MGM’s managing director in Australia, Mr Freeman, asserted, “In 200 years’ time the building will still be here and people will still see it.” He could not have predicted the coming revolution in entertainment technology that would see his, and most other Art Deco cinemas in Queensland, close their doors. The first blow for these cinemas came in the guise of drive-in theatres, the second in the arrival of television and the third in the rise of the multiplex. While the Metro lingered longer than its suburban counterparts, in 1972 – two decades before meaningful heritage legislation was enacted in Queensland – it was refurbished to become the Albert Cinema and its Art Deco features were razed. The building was demolished altogether in 2004, finally succumbing to the pressures of inner-urban development. 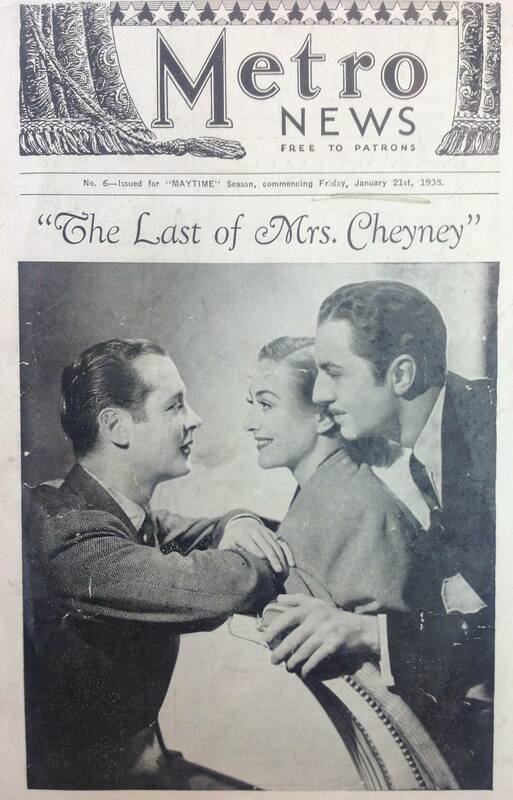 Metro News, 21 January 1938. Photograph by Queensland Deco Project. Physical item held by John Oxley Library, State Library of Queensland. Artist’s impression of the Metro Theatre. The Telegraph (Brisbane), 25 November 1936. 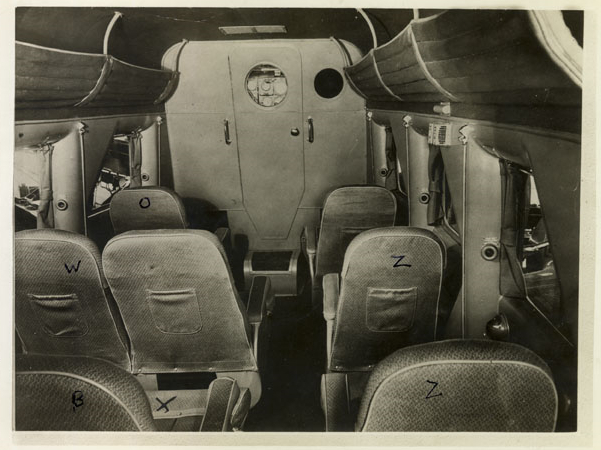 Interior of plane, Stinson plane crash inquest, 1937. Courtesy Queensland State Archives. 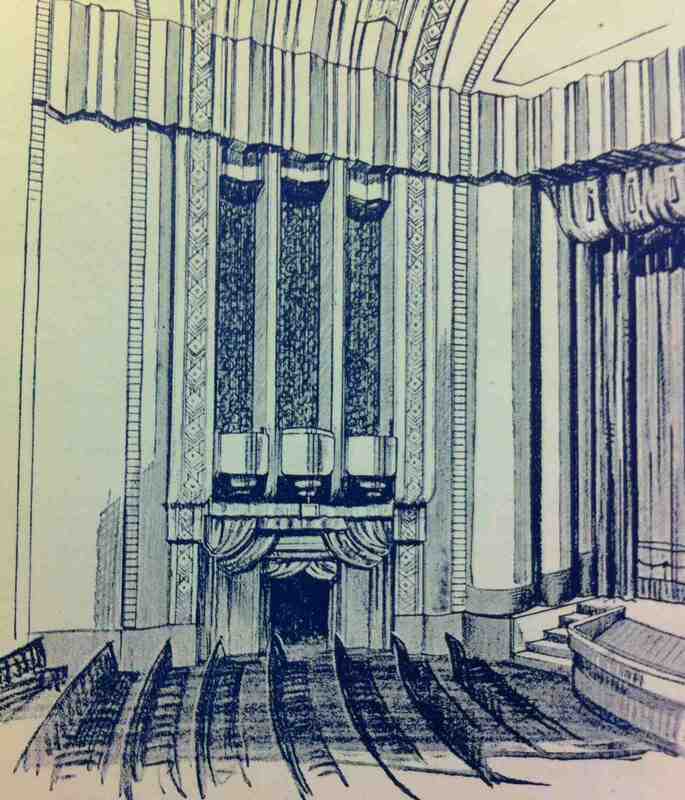 Drawing of Metro Theatre auditorium, Metro Souvenir Program, 1937. Photograph by Queensland Deco Project. Physical item held by John Oxley Library, State Library of Queensland. Image gallery L-R: Metro advertisements appearing in The Courier-Mail on 30 July 1938, 4 February 1939 and 19 November 1938. 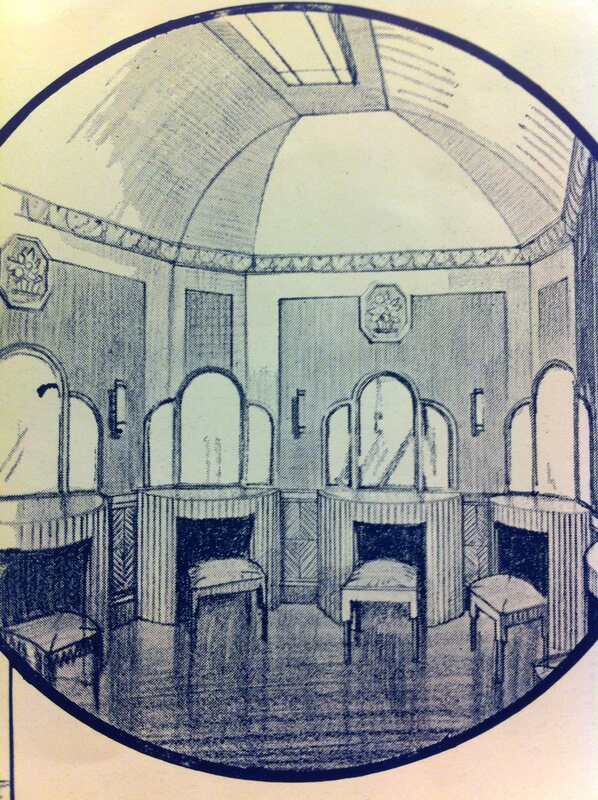 Drawing of women’s retiring room, Metro Souvenir Program, 1937. Photograph by Queensland Deco Project. Physical item held by John Oxley Library, State Library of Queensland. 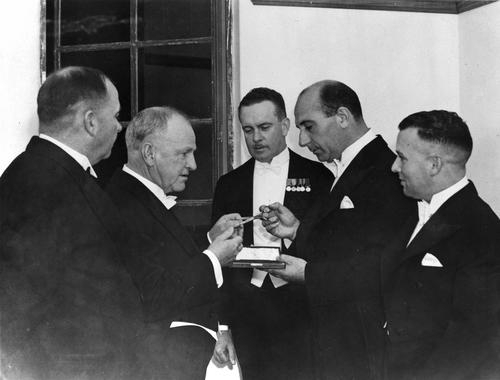 Dignitaries preparing for the official opening of the Metro, 1937. Courtesy State Library of Queensland. 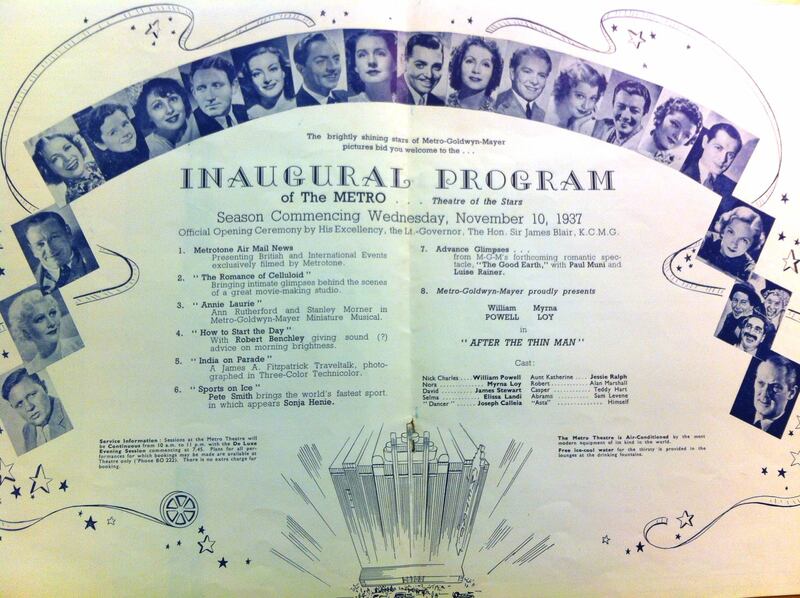 Inaugural Metro Theatre film program, Metro Souvenir Program, 1937. Photograph by Queensland Deco Project. Physical item held by John Oxley Library, State Library of Queensland. The following represents a selection of references used. “As New Metro Theatre Will Appear.” The Courier-Mail (Brisbane). 31 August 1937, p.21. Collins, Diane. Hollywood Down Under: Australians at the Movies, 1896 to the Present Day. Angus and Robertson Publishers, North Ryde, 1987. “Expression of Confidence in State.” The Telegraph (Brisbane). 12 November 1937, p.7. James Bailey, Julie, Tim Mather, Elizabeth Hibbard, Glenda Carriere and the State Library of Queensland. Going to the Pictures: The Cinema Experience in Queensland. State Library of Queensland, Brisbane, 1995. “Last Messages Scratched with Knife.” The Sydney Morning Herald. 1 March 1937, p.9. Metro Goldwyn Mayer. Metro Souvenir Program. Simmons Ltd, Brisbane, 1937. “Opening of Metro Theatre, Brisbane: Latest Development in the Growth of MGM’s Huge Australian Company.” Sunday Times (Perth). 21 November 1937, p.21. “Saucer-Shape Interior of Metro.” Sunday Mail (Brisbane). 14 November 1937, p.35. “The Seasons are Banned Forever in the New Metro Theatre.” The Telegraph (Brisbane). 8 November 1937, p.19. Fascinating article. Love the images. Looking forward to more on the Art Deco cinemas. Thank you for article and images, how sad The Metro was totally demolished. Great article. Interesting that American investment drove the screen industry in those early days. I learnt about the Stinson plane crash when I was at O’Reilly’s in 2014, so thanks for connecting the dots. Also, love your reference to performance of cosmetic rituals. What a tragedy for Brisbane’s cityscape that Mr Freeman was so wrong about the longevity of the building. Wow, so much fascinating history! Amazing to think of MGM expanding in Brisbane in those days, and being connected to the fate of the Stinson. Loved this article! If only we could see the building, it sounds beautiful inside.